To anyone who has paid any attention to craft beer in the past 30 years, the Sierra Nevada Brewery needs no introduction. While their story is big and their distribution wide, the brewery is in a relatively remote part of California. Those who have visited the brewery in Chico (and now in the second production brewery in NC, too) return to tell friends about all the beers pouring in their brewery restaurant that are never seen anywhere else. Fret no longer about not having the time nor transportation to travel to the source. A trip to Berkeley will now bring you to many of those special beers, and some old favorites in stunningly fresh condition. 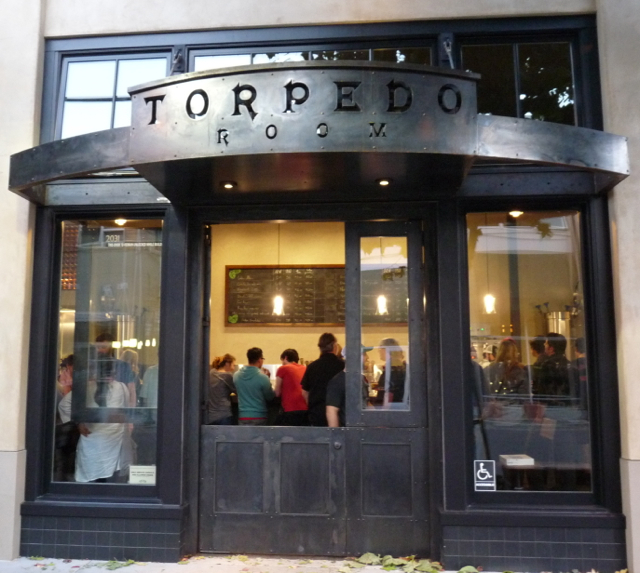 The Torpedo Room is the first Sierra Nevada taproom outside of Chico. You’ll find 16 taps and a really cool growler filler. The room is designed with tables and light fixtures fabricated from old brewery implements. There is no TV. They encourage tasting and talking about the beer. They pour beers in two or three sizes up to a pint so you can explore the wide variety of beers offered. They promise a full slate of beer education programs also. Minors are allowed in but they cannot touch a beer, whether in a glass or bottle. There are bottles and growlers for off-premise sale as well as other logo merch. You can’t get kegs here. There will be snacks but no meals. Often there will be a food truck outside. Extras: This part of Berkeley has many top-notch dining options within a short walk. For a pizza and good beer, Lanesplitter is nearby. For another adult beverage option, the Takara Sake factory and tasting room are across the street. On your way back to BART, you might want to look into one of Berkeley’s classic bottle shops, Ledger’s Liquors on University Ave. This trip is a bit beyond beyond the one mile we typically recommend for these walks, so unless you prefer 1.3 miles of exercise each way, take the AC Transit #51B-Amtrak bus* ($2.10 exact fare or Clipper Card) for part of the route or call a cab. Exit BART and go right to Sacramento St. Take Sacramento St. 4 blocks to University Ave. This is where you can pick up the bus. If you decide to walk it, turn right and walk down University about 11 blocks to 4th St. Cross University, walk under the freeway and continue on 4th St. for a block and the Torpedo Room will be on your left. Also, if you ride Amtrak to Berkeley, you are very close. Exit your train and walk a block up University to 4th St. Turn right under the freeway and walk a block to the Torpedo Room on the left. * If you take the 51B (Marina), get off at 6th St. and walk the rest of the way.